All new latest model, very reliable kit basic electronic cigarette starter kit. This is full OEM eCigarette Starter Kit including eGo GT Atomiser and 3 Click Variable Voltage GT Battery - All you need is eliquid to get vaping. Joyetech eGo GT Variable Voltage batteries is an upgrade on the normal eGo eCig battery, the power button also acts as a variable voltage button, so you can change the strength of vape you want to take from your e-cigarette. Its simple to change the power of your vape from the eGo GT VV e-cigarette, just click the button 3 times consecutively and the LED button will change colour to indicate what power you’re using to vape with. For a small quick vape on your e-cigarette it will light up Green, Blue for medium strength vape and Red is if you want to vape your e-cigarette hard. 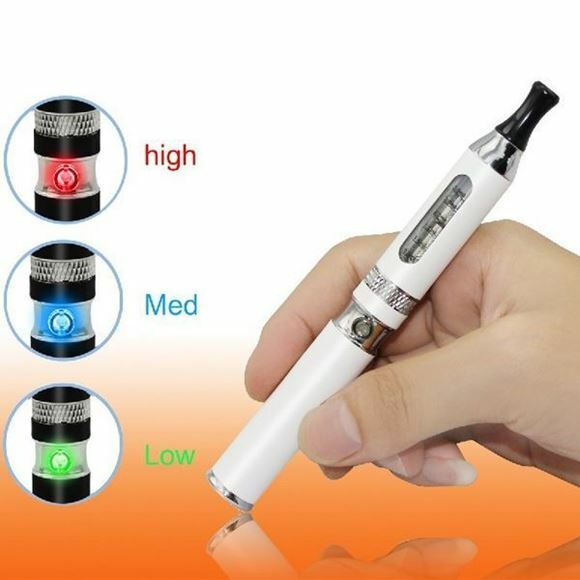 It also switches off the same as other eGo eCig batteries just simply click the power button 5 times. The following are some basic instructions on handling, use and care of your diKudi equipment. Please be sure to read this guide completely before using your device. Please also ensure the batteries are fully charged before your first use. The battery is locked when shipped (see charging and unlocking instructions below). This is top fll clearomiser hence first unscrew the clearomiser mouthpiece. Then drip or syring 3ml maximum (less if refilling as wick holds some juice even when the clearo is empty) into the tank while holding it at an angle slightly off vertical. Do not allow liquid to enter the hole on the center post. Once filled, screw the mouthpiece back on, being careful not to cross thread or over-tighten. Screw the cartomiser/clearomizer into the battery; taking care not to cross thread or over-tighten. NOTE: Over-tightening chargers, clearomizers and atomizers can damage a battery. Carefully screw on these components until you begin to feel resistance; then apply a maximum further one-quarter turn. When you receive the battery, it will be locked (see unlocking instructions below). Once unlocked, simply hold down the button as you take a draw. This activates the device and creates the vapor. Release the button just prior to the end of your draw. The batteries have a button operated lock; which prevents unintended activation of the battery. Batteries are shipped locked. To turn the battery on, click the button rapidly 5 times. The LED will then flash 3 times indicating it is now in standby mode; ready to use. To switch off, click the button 5 times. The LED will flash 3 times and then the battery will be locked. Some eliquids vape better at a lower voltage and some higher - and "better" can be somewhat subjective; so having this feature allows you to choose what’s right for you. To change voltages is very simple - 3 rapid button clicks takes you to the next setting. The current setting is indicated when you press the button by the colour of the LED light. Green signifies the low voltage (~3V), blue medium (~3.6V) and red, high (~4.2V). We recommend trying your juices at the low setting (green) first as this is also the most energy efficient and will provide the longest battery life between recharges. The "normal" setting is 3.6V (blue). Please fully charge the battery before use. IMPORTANT: Only use the diKudi supplied 420mA charging lead. Using other chargers may damage the device and create a fire risk. Ensure the battery’s connector is dry and clean before connecting to the charger. The battery is connected to the charger by screwing it into the device. Take care not to cross the thread or over-tighten. The battery will take 3.5 - 4.5 hours to recharge from flat using the USB wall plug. We strongly recommend the use of the USB wall plug. The battery includes IC (integrated circuit) protection on the PCB (Printed Circuit Board), which prevents over discharge, over charge and over current. The battery charger will automatically switch to standby (green) once the appropriate voltage has been reached. Please note that the USB wall plug LED will remain the same colour, regardless of charging stage. The wall plug also contains safety features in its circuitry. Regardless of the safety features, a charging battery is a fire risk. You should not leave a charging battery unattended and the battery should be removed from the charger as soon as the cycle is complete. Like any electronic device with a lithium battery, some basic safety precautions should be taken; with some extra points for consideration given the nature of personal vapourisers. Don’t hesitate to contact us for clarifications. Only use the diKudi charging lead specific to your battery and AU approved wall plugs. Keep the battery dry and clean the battery connector with a cloth before charging. Do not expose to extreme heat - such as leaving in the car on a hot summer’s day. Never charge a battery unattended and check battery regularly while charging. If battery becomes hot when charging, remove from charger immediately and contact us. Remove battery from charger as soon as charging cycle is complete. Do not use cartomizers, clearomizers and modifications not suited to the battery. Batteries should be rested for an hour after charging. Avoid dropping a battery and do not subject it to other forms of shock. More performance and safety tips available at www.diKudi.com.au.